Pewter is an attractive grey alloy of tin, copper and antimony used for centuries in the production of cups and trophies. It can be easily worked, shaped and polished to a high lustre. This quaich features a 300mm diameter shallow bowl to form the basis of this stylish trophy. Working with specialist pewter craftsmen in Sheffield, England, we developed a twin walled bowl to create a wide flat rim strong enough for the lugs to be attached. It is traditional to apply pewter marks to objects made from genuine pewter. 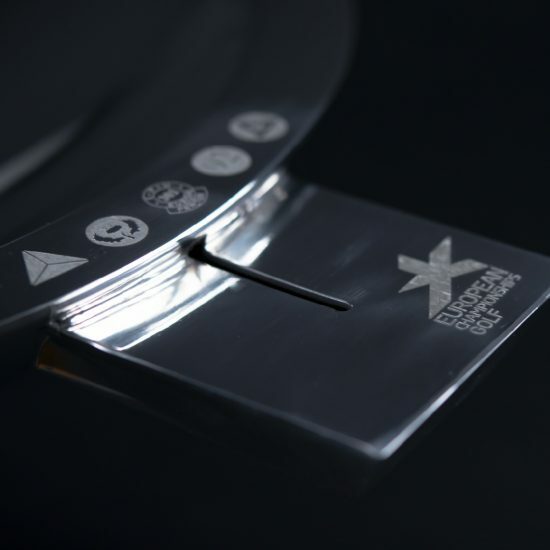 Rather like silver hallmarks, they define the year of make, location, the purity of pewter and standards marks and are laser engraved around the flat rim of the bowl, whilst the lugs are each engraved with the event emblem. The elegant shadow bowl is supported by a square plinth machined from solid Scottish oak sealed with a satin varnish. Each face is laser engraved with the emblem, burnt deep into the surface of the oak, and a satin pewter wrap provides an engraving surface. 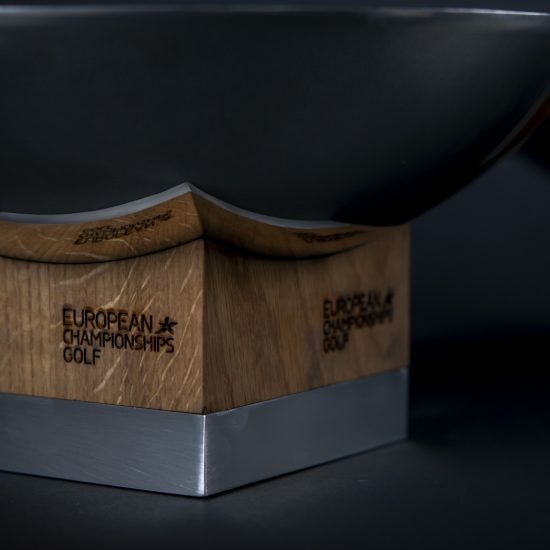 The 2018 European Golf Team Championships were hosted at Gleneagles, Scotland. It was the inaugural event and consisted of three competitions – men’s, women’s, and mixed team formats. 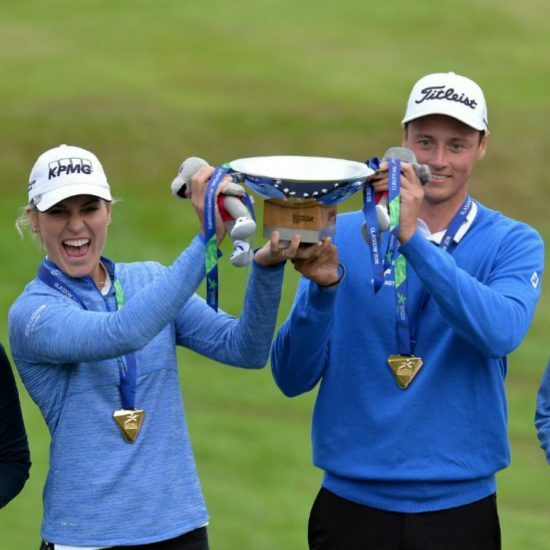 Iceland, a tiny nation not known for golf, made history by winning gold in the Mixed Team Golf to lift one of the three trophies created specially for the tournament. 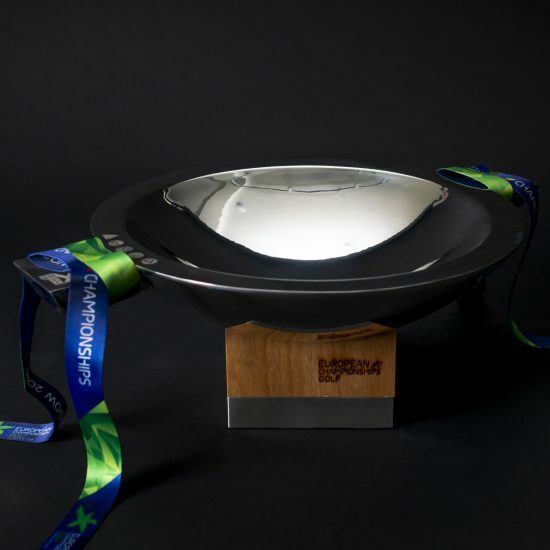 The trophy needed to be large enough to be shared by a team on the victory podium and Icelands victory will be the first to be recorded on the plinth plate.